BT has over 30 years' experience providing network-centric, mission-critical services for data and voice communications and hosting in the financial community. BT Radianz services help you to change the way that you do business. The traditional communications model of multiple application services spread across separate circuits, suppliers, equipment and management adds to complexity and costs with little if any benefit. That’s why you need a 21st-century solution that reduces complexity and costs – a solution that links you to clients and counterparties, banks and brokers, exchanges and industry infrastructures, services and applications - and that is fast, reliable and secure. 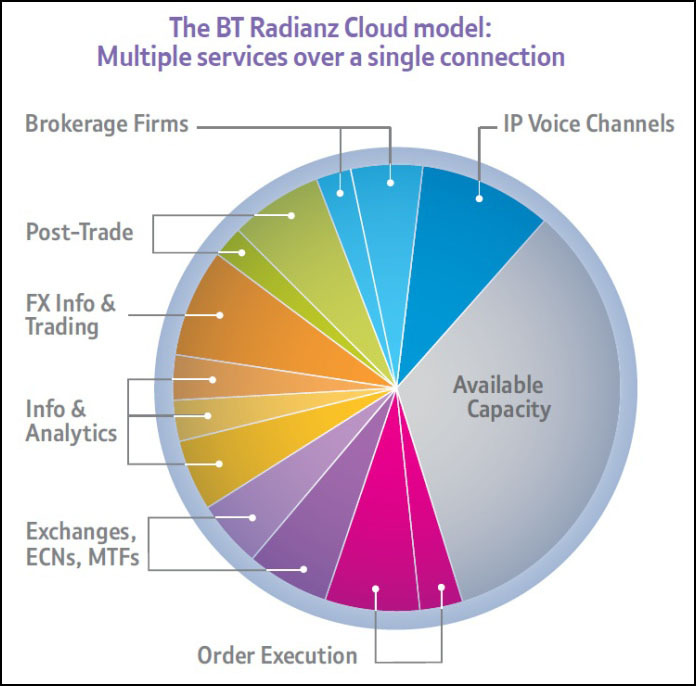 If you’re a provider of services to the financial community, the BT Radianz Cloud enables quick and easy distribution of your services and applications to your clients and counterparties, as well as access to its broader user community that today includes many thousands of member locations around the world. If you’re a user of services from the financial community, the BT Radianz Cloud provides quick and easy access to an ever-increasing range of over 400 service providers covering almost every aspect of wholesale financial services. Whether you need to communicate for banking services or financial markets, for payments or order routing, for the front office or the back office, the BT Radianz Cloud enables you to do so quickly, securely and reliably. Our range of BT Radianz Services include specialist network-centric services for the financial community, including ultra-low latency connectivity services and managed hosting services, managed encryption services and secure messaging services for non-repudiable and tamper-proof message exchange. And now we are able to offer BT One Voice Radianz a new service that unifies voice, mobile and data services and delivers them to members of the BT Radianz Cloud, the world’s largest secure networked community for the financial services industry. Enquire now or contact your BT Account Manager to learn more about BT Radianz Services. Firmly focused on the financial services sector Over 30 years' experience providing network-centric, mission-critical services for data and voice communications and hosting in the financial community including banks, brokers, exchanges, investment managers, payment processors, hedge funds, financial application providers, CCPs and CSDs. We have an existing user community of thousands of financial institutions around the world that already use our award winning BT Radianz Services for the financial sector. Our solutions cover the entire trade lifecycle and range of trading strategies.